Welcome to this month’s edition of our Thrift Store Upcycle Blog Hop. Don’t forget to scroll down and see all the other upcycle DIY projects. 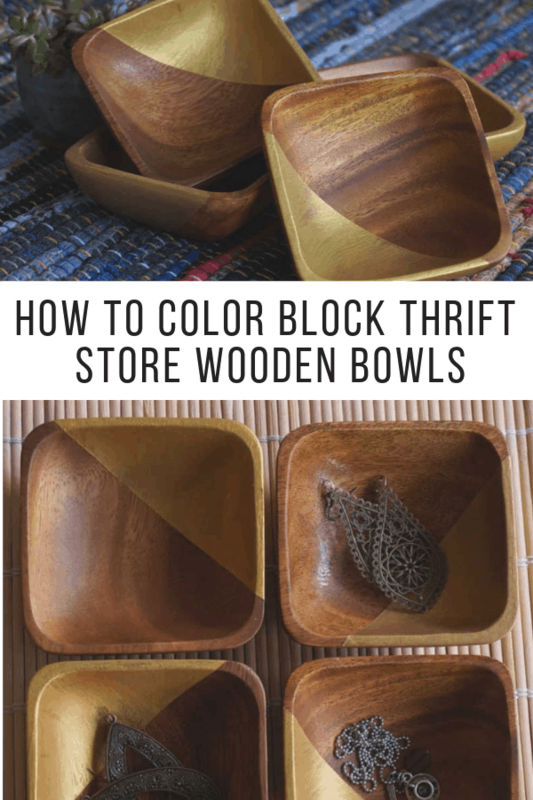 I’ll be updating some cheap wooden bowls with a color block paint technique. This project doesn’t use very many supplies. You probably already have these in your stash. This is another super simple thrift store makeover! 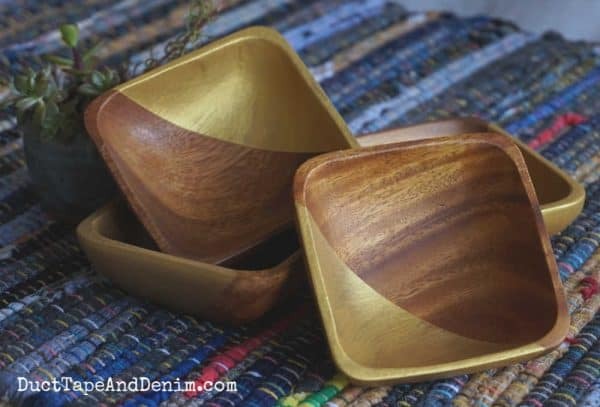 I started with a set of 49 cent wooden salad bowls from the thrift store. They were in good shape but I thought they could use a little update. 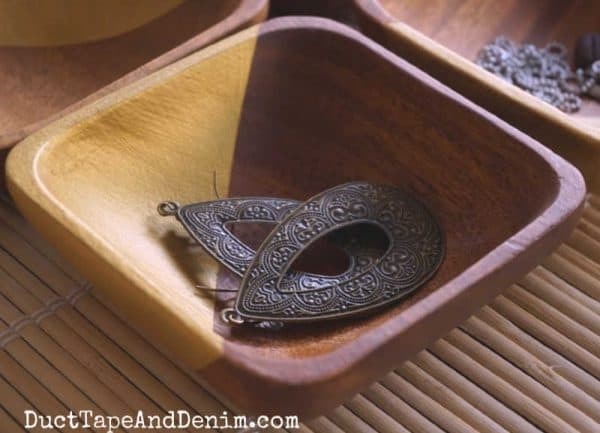 If you find old wooden bowls that are faded or lightly scratched but you still don’t want to paint them, watch the video in this blog post to see how easy it is to restore them. Since the bowls were in such good shape I didn’t want to cover up all the beautiful wood grain so I taped off a corner of each bowl. I made sure that the edge of the tape was smoothed down so no paint would bleed under it. Then I gave each bowl three coats of gold metallic paint. After the third coat of paint, I carefully pulled off the tape. When the gold metallic paint was completely dry, I covered the entire bowl with clear varnish. I wasn’t planning to use these for food, so I just used my regular varnish. They’ll only be used for displaying or organizing my jewelry. Take a look at my Facebook Live to see how easy this is. I was really happy with how they turned out. Just enough extra bling without covering up the natural look of the wood. Notice I didn’t make each bowl exactly the same. No measuring here! By the way, I made all the jewelry in these photos and they’re for sale in my Etsy shop and on Amazon Handmade. The varnish will protect the metallic paint from being scratched by the jewelry. The bowls look great! Very pretty! These are so cute! I always see wooden bowls while thrifting! This is a great way to use them! I love these bowls. I have the round version and you have inspired me to dig them out and give them a makeover. Thanks! 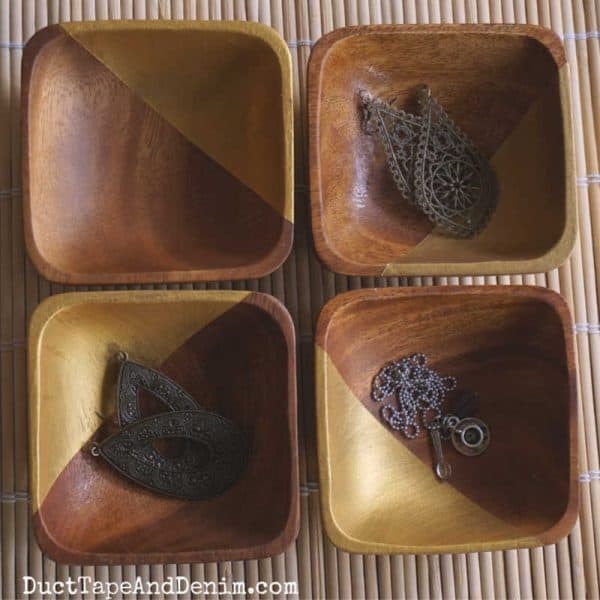 These little bowls look so pretty by themselves or showcasing the jewelry you created. This turned out super cute and your jewelry is beautiful! What a great way to display it! These bowls are just adorable! Thank you for the inspiration! I love your bowls but I have to say I love your earrings even more! Those boho ones on the top right. Need to hop over to your shop asap and see how much shipping to Germany would be. What a fun update! 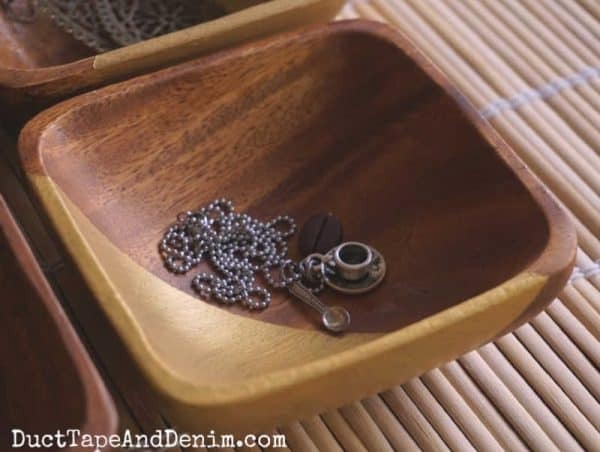 I always see little wooden bowls and never had any idea what to do with them. My teen daughter would think this was a fun way to organize her earrings, rings, and eye shadows.